There are several computer programs out there that insurance companies use to calculate what they will offer you for your claim. The most well known of these insurance claim software packages is called “Colossus,” and if you check around (for instance, surf around in Google Scholar cases), you’ll find that Colossus is the computer claim calculation software of choice for big insurance carriers like Aetna, The Hartford, and USAA. Another popular claims adjuster software product is called “Xactimate,” which is a competitor to Colossus for the insurance company’s dollar. Personal injury lawyers representing plaintiffs in Florida and elsewhere know about Colossus and the other insurance company claim calculation software. Of course, the big insurance companies are crying foul – they argue that Colossus and its competitor claim computation software really work to make things more efficient in claims processing across the board. Claims are settled more uniformly across the country, for example. Funny how many policyholders and injured plaintiffs don’t see it that way. Colossus® is the insurance industry’s leading expert system for assisting adjusters in the evaluation of bodily injury claims. Colossus provides adjusters access to your company’s claims data within a defined business process management framework for evaluating injuries, treatment, resolution, impairment and general damage settlements. Colossus helps your adjusters reduce variance in payouts on similar bodily injury claims. Your adjusters can quickly interpret medical reports and look up definitions of injuries, treatments, complications and permanent impairments using AMA 5th edition data. Through a series of interactive questions, Colossus guides your adjusters through an objective evaluation of medical treatment options, degree of pain and suffering, degree of permanent impairment to the claimant’s body, and the impact of the injury on the claimant’s lifestyle. At the conclusion of a Colossus consultation, a summary of the claim is provided, including a recommended settlement range. Colossus is equally effective for personal or commercial lines. What Colossus and other insurance claims adjusting software does is give the insurance company a suggested number to pay on the claim after the software analyzes things inputted by the insurance company employees. Things like the age of the injury victim, the location of the accident, the expertise of their lawyer, if they have a lawyer, and the extent of the person’s injuries. Then the insurance claims adjuster can use that claims number as the company wishes. Maybe it’s used as a negotiation tool. Maybe it’s used as the settlement claim offer. Here’s the thing: people are people. 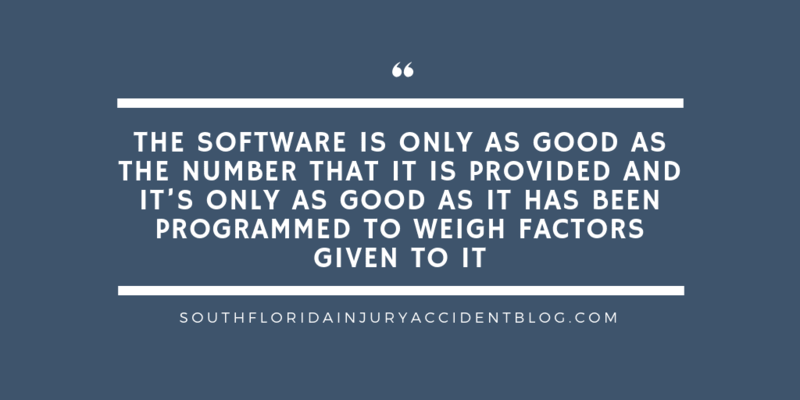 The software is only as good as the number that it is provided. And it’s only as good as it has been programed to weigh factors given to it. Personal injury lawyers in Florida, especially, are well aware of how individual injury claims truly are. Pain and suffering, for example, should not be paid based upon a statistical averaging of sorts. Different people have different pain tolerances. Also — how can a computer understand the loss of consortium felt by a spouse? Or how the injury victim has lost enjoyment of life now and in the future? For those people here in Florida who want to negotiate their own injury claim settlement with their insurance company, without hiring a lawyer, that is your right. We’re here to help you by sharing this information about the claims adjusting software used by insurance companies today — because odds aren’t high that the insurance carrier is going to tell you. Tip: find out how long your claims adjuster has been doing adjusting work — the newer the claims adjuster, the higher the likelihood that he or she is relying on the computer printout from the computer claims adjusting software when he or she gives you a settlement amount. See: 5 Things You Should Know About Car Insurance Adjusters When You Have A Car Accident Claim. There are lots of ways that this insurance settlement software can be used to help the insurance company get the lowest offer on the table possible. The most common practice: train the insurance adjusters on how to manipulate the claims so that the settlement software works in the insurer’s best interests. The insurance company can adjust the software’s programming at the home office. Then, when the adjuster gets a claim and uploads its information, the settlement value will be lowered automatically. This will happen even if the adjuster doesn’t fiddle with any individual claim information. They do that too, of course. The insurance adjuster makes the decision on what gets inputted into the software program. He or she can decide what codes to use for the injuries sustained in the accident. Different codes are used for different injuries: a slight concussion will have a different code than a severe traumatic brain injury, for instance. Even though the insurance adjuster has little if any medical expertise or education, it’s the adjuster who will determine how the claim is coded. It’s surprising for many to learn how insurance adjusters are trained by their employers to review medical records (including diagnosis and treatment plans) in order to decide the best codes to use. Lower codes on a claim mean lower computed settlement offers. Third, most physicians will conclude their medical reports with opinions on how the patient will heal and how long that process will take. This is their “prognosis.” If a patient will need ongoing therapy or rehab treatment for an extended period of time, this is included in the doctor’s prognosis. It is called the “resolution” of the patient’s injury. Insurance adjusters will review the coding for the claims presented to them including the doctor’s evaluation. They are encouraged to use the final prognosis code that tells the software program the injury has been resolved. This is often done even if the actual medical evaluation is clear that there will be a need for continued or future treatment. Changing the prognosis and resolution that is given to the settlement software to disregard future medical care will lower the computed settlement offer. Alongside Colossus and its competitor settlement software, insurance companies have “re-pricing software programs.” One example is a program called DecisionPoint. Insurance adjusters are often instructed by their employers to use re-pricing software as part of their claim evaluation. Each medical bill or health care invoice that is submitted by the accident victim will be inputted into the re-pricing software by the adjuster. The result? The re-pricing software will lowered the accepted amounts for those medical expenses. The re-pricing software will adjust the expenses to ‘usual and customary costs” for that service or drug. Re-pricing software will lower the accepted medical costs covered by the insurance company as part of its settlement offer. The offer will not reflect 100% reimbursement of the patient’s medical bills as submitted to the patient by their health care providers. Finally, insurance companies train their insurance adjusters to look to the accident victim and find fault. Adjusters will be on the alert for anything that they can use to point the finger at the injured person as a means to lower the settlement claim amount. Then they can tally an estimated percentage of culpability and input that into the settlement software program. If the adjuster can find the accident victim contributed 10% to the accident, then that can be part of the settlement software’s calculations. The adjuster’s 10% will spew out a settlement claim amount that is 10% lower than it would be otherwise, as calculated by the settlement software. A good piece of advice if you have been harmed in a car accident or slip and fall, is to speak with an experienced personal injury lawyer before you file a claim to learn about some of the issues that can arise with these claims, including the type of evidence needed to prove a claim and the type and amount of damages you can recover. Most personal injury lawyers, like Alan Sackrin, will offer a free initial consultation (over the phone or in person) to answer your questions. What is My Injury Claim Worth and How Can I Get Maximum Compensation for My Injury Case? Why Is It Taking So Long To Settle My Case? Is It Time to Settle Your Car Accident Case (Injury Claim) or to Take Them to Trial? Hello, Alan, I found your article very informative. Unfortunately, I am not in Florida to consult with you specifically on my claim. But i would ask when dealing with insurance companies that use computer software is there any options to compel the to provide confirmation of the injuries they considered. I am having trouble getting the adjuster on my claim to tell me exactly what injuries were considered in the evaluation. They have been very evasive. Is there anything that protects them from providing this info?